My recent visit to Croatia included a stop Đjakovo/Đakovo. The scenery on the drive from Zagreb to Đjakovo was lush and green everywhere I looked. We drove through charming villages, each accented by the church steeple. I am so grateful to have family in Croatia that can chauffeur me wherever I need to go. It’s not that I think it would be hard to navigate around this beautiful country, it’s that having this service allows me to enjoy the views! Đjakovo was unusually warm the days I visited, or so my hosts told me. I think. My knowledge of the Croatian language is rudimentary at best. Visiting their farm and sampling all the wonderful food they grow was such a gift. I don’t know how many tourists get this opportunity. Fresh raspberries, cherries, cucumber, and so much more. Every meal was made from scratch. The traditional soup, the breads, torta, kolache, I have to be careful not to eat my way through Croatia. I tasted cherry Rakija, a homemade liqueur, It was Sveti Anthonys dan, St Anthony’s Day, so we toasted with straight Rakija. WHOO! One small shot is plenty for me. Đjakovo takes great pride in their horses, located on the State Stud Farm – Ergela-Đjakovo, home to Lippizan horses. This made it a must for me. Queen Elizabeth has been gifted with 2, I’m told. We saw the dams and foals as they were near the entrance, given the heat, most of the Stallions had retreated to cooler spots. Aesthetically pleasing stables and views, these horses have the life. Late in the afternoon, we visited the town square, the park and of course, the Katedrala bazilika Svetog Petra; Cathedral basilica St. Peter. The tile work and artistry in this Cathedral is magnificent. Be sure to leave time to stroll through Strossmayer Park, its tree-lined paths and lush greenery offer meditative quiet time. Its benches an opportunity to stop and breathe. Below is the statue of honoring Bishop Strossmayer, who is responsible for pulling together the funding for the Cathedral. You can find him presiding over the square directly in front of the Cathedral. Before heading home for the night, we stopped for ice cream at one of the sidewalk cafes in the square. These sidewalk cafes number among my favorite things about Croatia. I could do a tour of each city’s sidewalk cafes! I bask in the relaxed atmosphere, fresh air and friendly service. Olive oil, fresh bread and a drink. Yum! Đjakovo was warm and inviting. Everywhere I have gone in Croatia, the people have been friendly, the food delicious and the memories priceless. Our next stop is Brač, Dalmation Islands, Croatia. I can hardly wait. This entry was posted in Family Fun, Natural Beauty, Traveling Fools, Uncategorized and tagged Croatia, Djakovo, Family, Friends, Lifestyle, travel, Wine on July 15, 2018 by notsooldladies. Leaving Parachute we headed to Palisade, CO aka Colorado Wine Country. We had booked our stay at the Wine Country Inn. 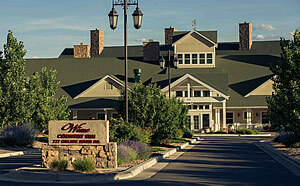 Surrounded by wineries and not far off the highway, the inn is lovely, the staff friendly and helpful. 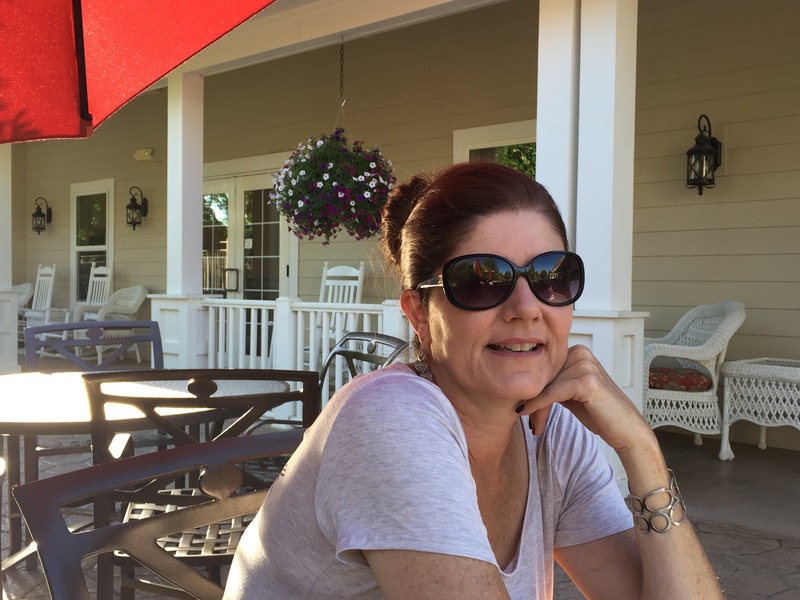 While checking in, we solicited their advice about wineries they would recommend we visit. The woman at the desk asked us a few questions to get a feel for our taste in wine. Sherry answered as I rarely drink alcohol. 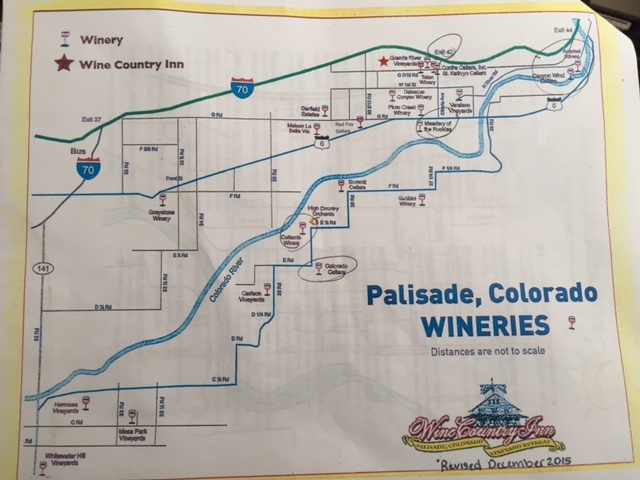 🍷Based on Sherry’s replies, she gave us a map and suggested a few wineries. As we had arrived in mid-afternoon and the temperature was 102° , she kept the list short. Most of the tasting rooms close at 5 p.m. Off we went. There are bikes to rent at the hotel and around town that allow you to bike from winery to winery. For us, it was simply too hot. There are also luxury wine tours, horse-drawn carriage tours, etc. to personalize your visit. Palisade’s motto is Life tastes good here all year long, and is known for its peaches, simply delicious. Be sure to try some. If you have time to visit the art galleries and lavender farms, do. 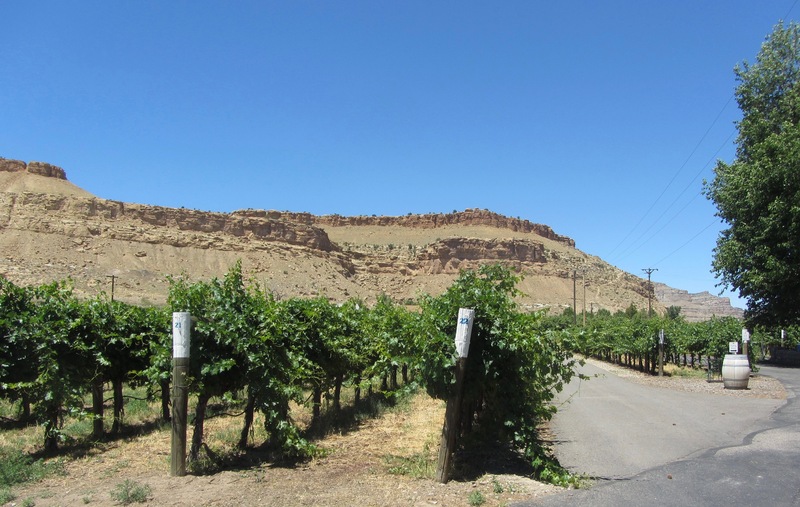 Our first stop was Canyon Wind/Anemoi Cellars. Surrounded by the vineyards, the tasting room has a few tables out on the lawn under beautiful shade trees. We said hello to a group of women enjoying their wine and entered the tasting room. There is a small storefront with a warehouse in the back. The owner gave Sherry a couple of samples, and discussed wine-making with us. Sherry bought a Chardonnay and we continued on our way. 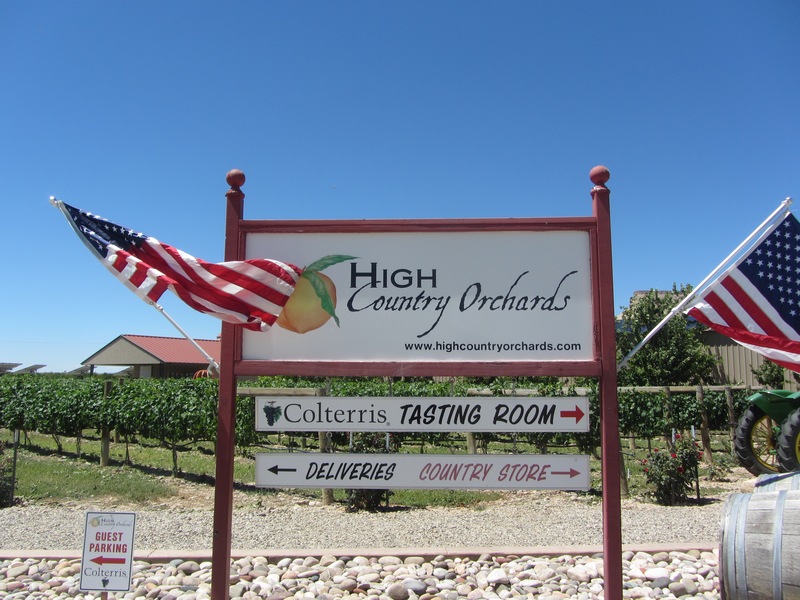 Our next stop was High Country Orchards and Colterris Wines. In addition to wine, there are lots of fresh fruit for to enjoy. 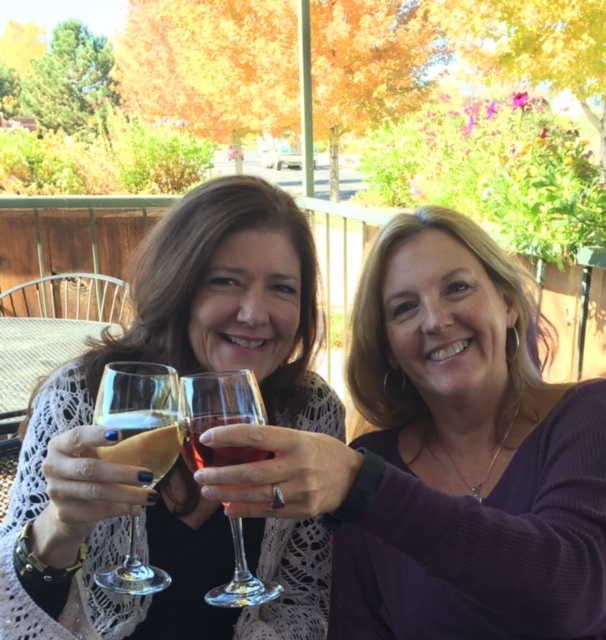 After tasting, Sherry preferred their 2014 Cabernet Franc and 2015 CORAL White Cabernet Sauvignon. As this was our second stop, it was hot and we were hungry, we decided to sit on their patio for a bit. We ordered a glass of the White Cabernet Sauvignon. 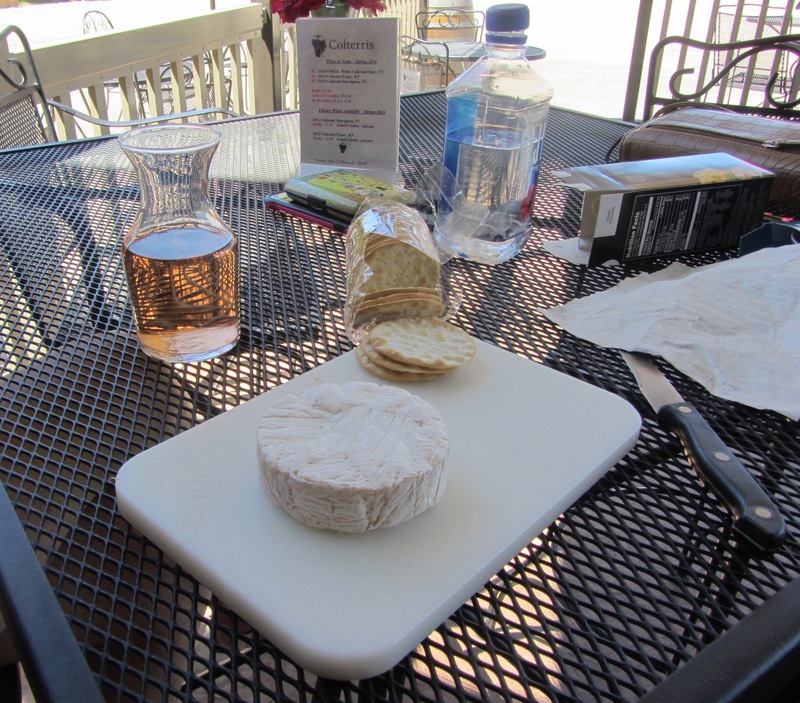 What’s a glass without some brie, crackers and of course, chocolate! As a non-wine drinker, I can tell you that this white Cabernet Sauvignon is wonderfully delicious. After an enjoying our light lunch, we moved on. 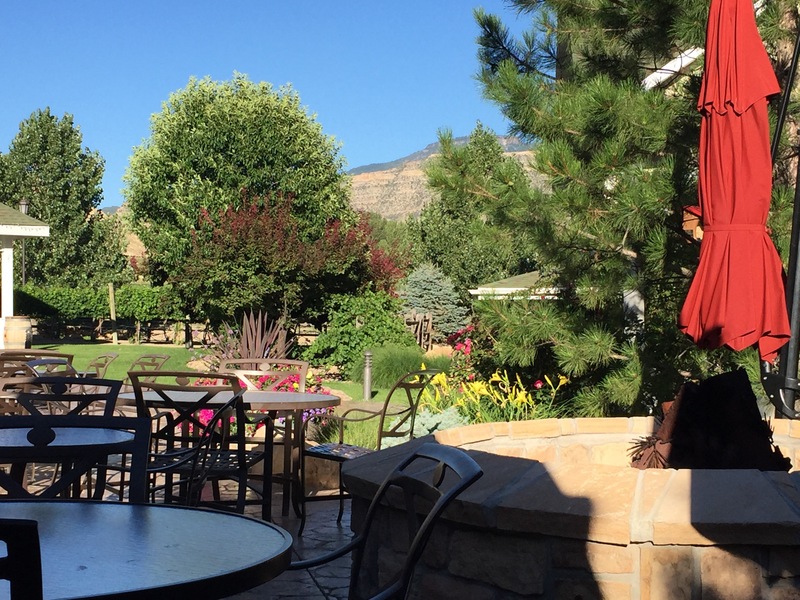 A short drive up the road, we stopped at Colorado Cellars, they offer fruit wines and mead, in addition to their reds and whites. 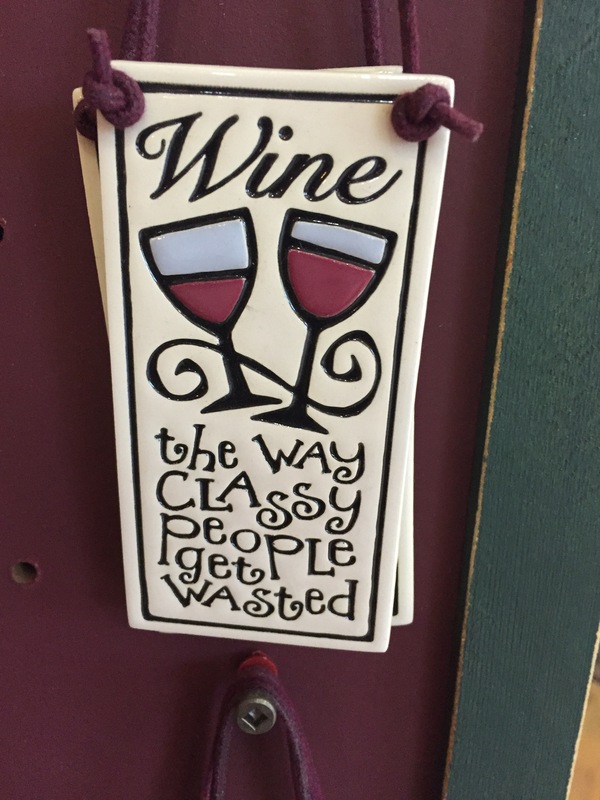 I apologize to Colorado Cellars for not taking pictures, I’ll blame it on the glass of wine I had at lunch. I did purchase the blackberry wine and Golden Nektar Mead for tasting at my next family game night. 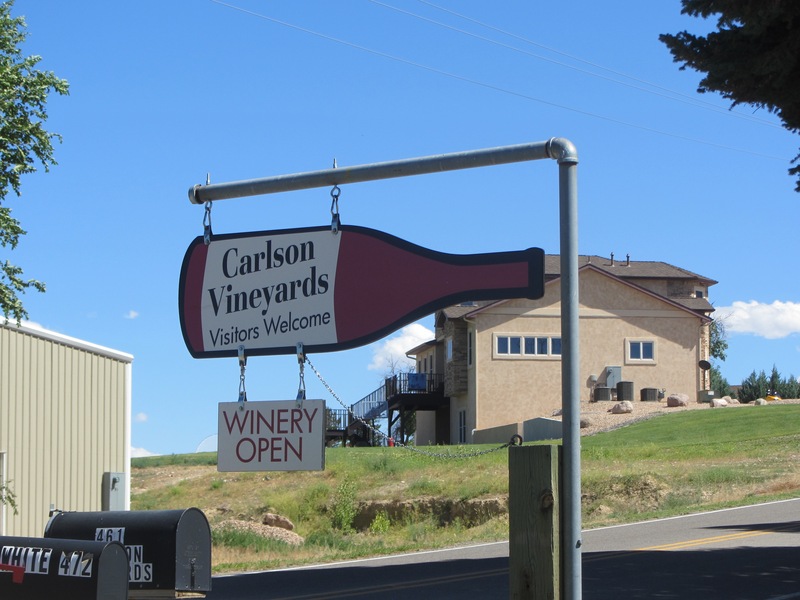 Just around the corner, we pulled into Carlson Vineyards. 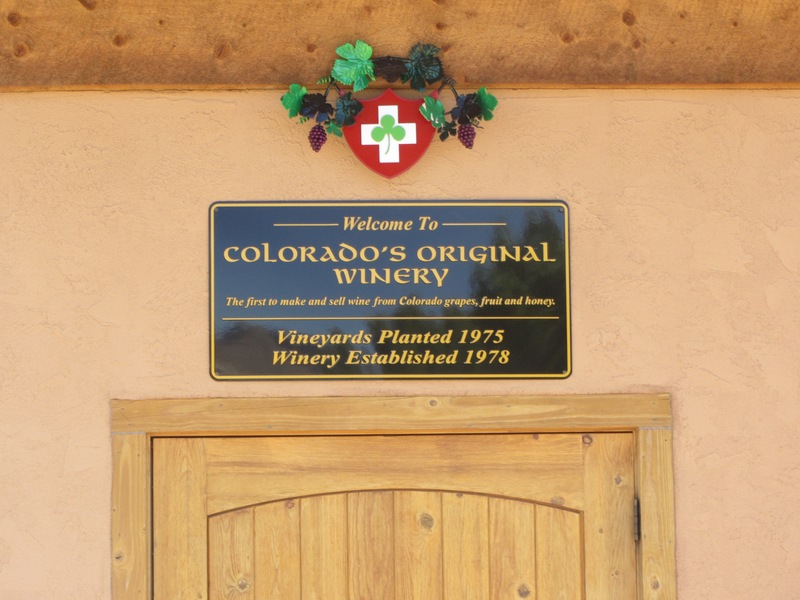 They are Colorado’s original winery. 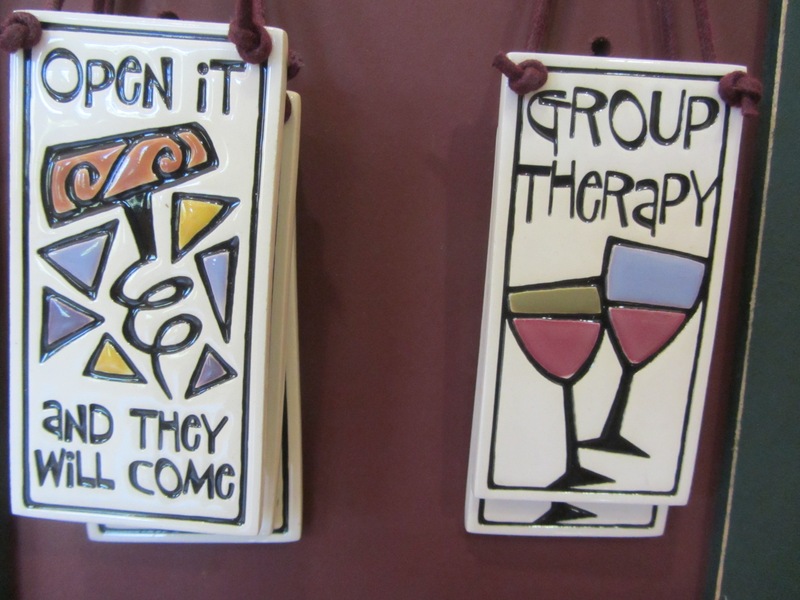 Carlson Vineyards has a nice gift shop in addition to a tasting room. They offer a shaded outdoor area too. 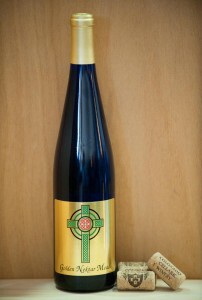 Here we sampled several fruit wines and browsed their gift shop. Although we did not buy wine here, they were quite good. 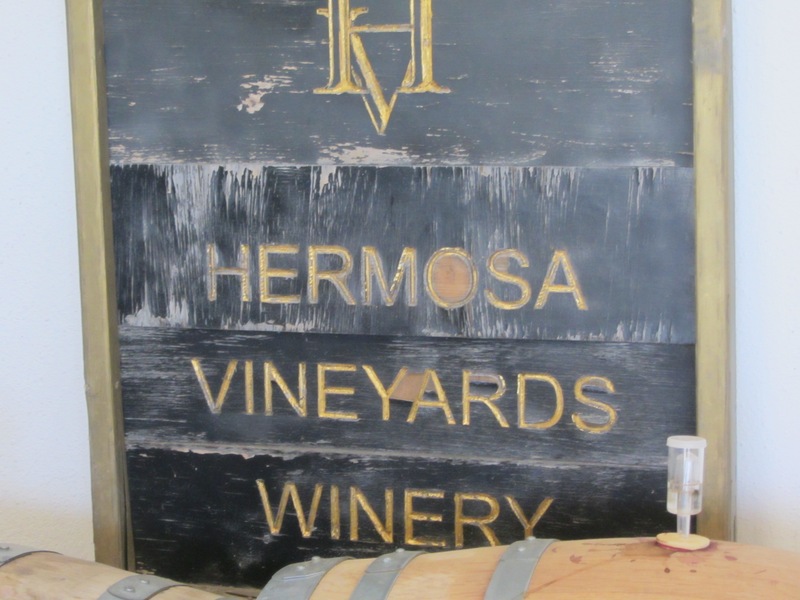 Our next stop was Hermosa Vineyards. Here we had the pleasure of the meeting the owner, he told us that he crafted the wines to his personal taste. He talked about his process and different grapes. He provided buckets for us to dump any leftover wine, which was probably a good idea as we’d been “tasting” for a couple of hours at this point. Sherry enjoyed all the wine she tasted here. 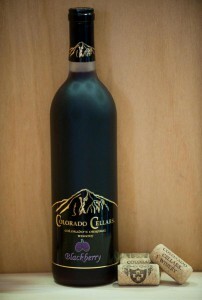 I bought a Cabernet Franc, Cabernet Sauvignon and the Dessert Wine, which he had us taste with a piece of Dove chocolate. Heaven! 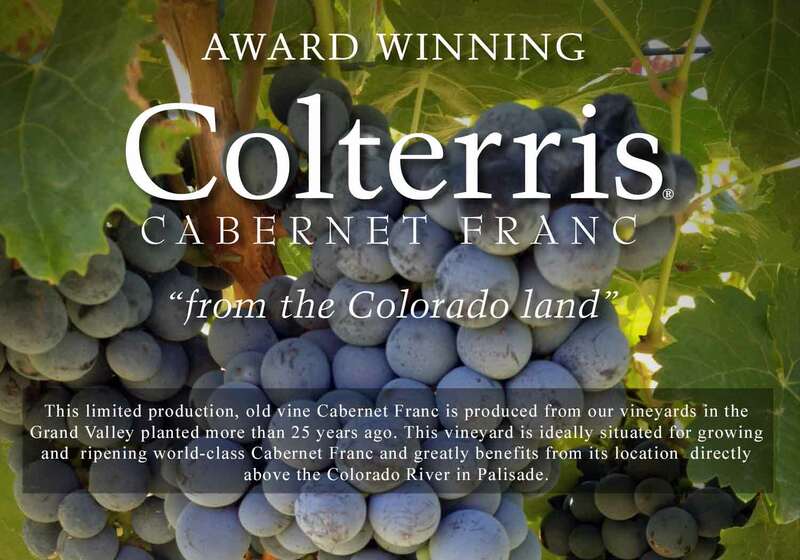 Sherry purchased the Cabernet Franc. We had a lovely visit at the Hermosa Vineyards tasting room but it was now time to head back to our hotel for a swim and a meal. 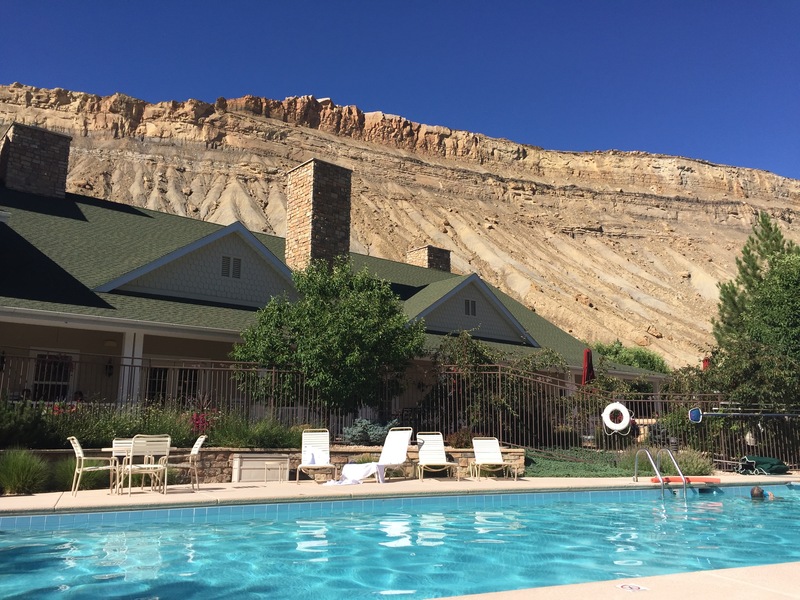 The view from the pool is breath-taking, the water cool and quite welcoming after a hot day. We dined al fresco, seated among blooming flower gardens and baskets. The meal was tasty, we recommend the macaroni and cheese. Yum! We’ll be back in Colorado Wine Country soon we hope. It’s perfect for a Mother/Daughter, Girlfriends or Couples trip. 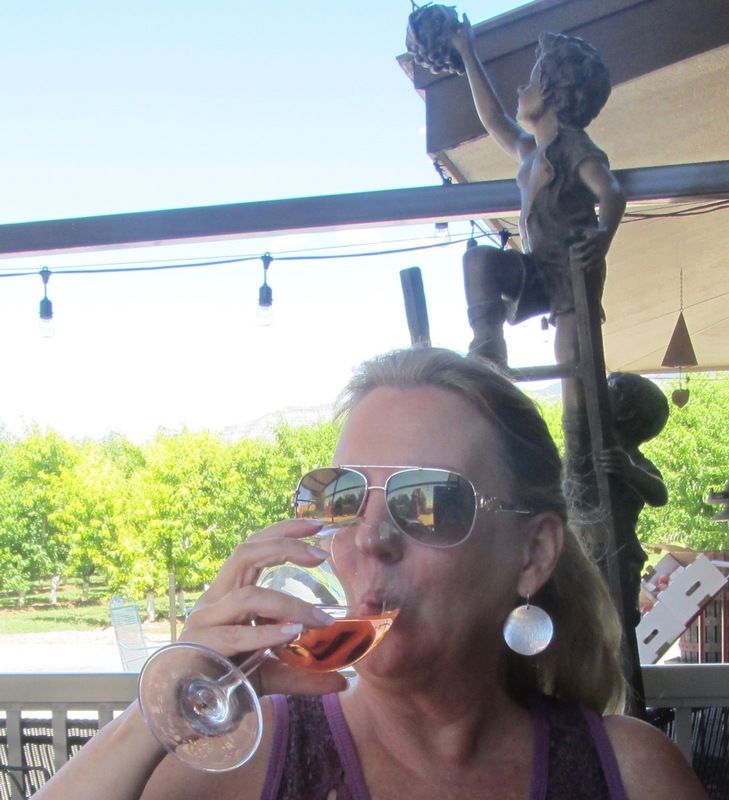 This entry was posted in Cheers!, Perennial Ponderings, Traveling Fools and tagged Colorado, Friends, Friendship, Lifestyle, Road Trip, Wine on July 20, 2016 by notsooldladies.